When I asked Aaron for a recap of this week on the farm from his perspective, he said simply "can't, too tired." This may have something to do with the fact that we may have driven to New Jersey and back last night to hear Jay-Z and Beyonce in concert and weren't in bed until 2 am (this goes without saying, but it was amazing), but it's also been a very very busy week on the farm. We started harvesting carrots, cukes, green beans, squash, leeks, and onions, attended three markets between Thursday and today, and had many serious meetings about the exciting next moves for our farm. We're eating squash blossoms and roasted green beans daily. And summer squash, by the pound. While we toil away on all sorts of chaotic July tasks, the tomatoes grow quietly and steadily, laying in wait, getting ready to ripen. We're SO ready. The nigella are blooming, delicate and spiky and mysterious. My all time favorite color of snap dragon - I've got two plants out there making me these beautiful stems. To die for, if you ask me. A harsh reality of farming without pesticides: when the eggplants get overrun with Colorado Potato Beetles, the only thing to do is slowly walk the rows and systematically smush them with dirty fingers. Luckily, the eggplants continue to grow strong and healthy through some significant bug pressure. We grow 'em tough. It's been quite a week here at DF, and we're going to bed shortly (hopefully before dark!) - we know that next week will be just as crazy as last week, but Sunday evenings offer us a rare moment to sit quietly and breathe slowly. Before bed though, some photos from around the farm from the past few days! Look, we even make time for fun! This was a watermelon eating contest in honor of Elise's birthday - each contestant got half a watermelon, a butter knife, and five minutes. Your melon was weighed before and after. Suffice it to say, people were pretty juicy by the end, but the birthday girl was victorious - with a whopping 1.86 pounds! Summer squash has arrived! We planted 8 Balls, Flying Saucers, Saffrons, Zephyrs, and Patty Pans in addition to the standard zucchini and yellow squash because... they're awesome? Sometimes we get so preoccupied by the output that we forget to look around and appreciate the whole complicated machine. We're thankful. Here's hoping that the summer solstice finds you well! The longest day of the year was yesterday, and we made sure to savor all fifteen hours and six minutes of sun. The veggies are enjoying the long hot days, growing fast and healthy, and we've finally worked out the majority of our market schedule for the summer. Click through to our markets page for updated details. It was a sweltering and misty 80 degrees by 7 am last week. We're ramping up into the breakneck pace of high summer - harvesting summer crops as quickly as we can plant fall ones, going to countless markets, and hardly ever sitting still. This is the time of year when a pint of strawberries, a fistful of arugula, and a few peas is a totally legitimate dinner and a shower at the end of a sweaty day starts to seem increasingly optional. We're grateful for the warm evening breeze, the swarms of dragonflies that circle the barn hunting mosquitos, and cold beer. In the fields, the tomatoes, peppers, and eggplants are settling into their new earthly beds and, despite some suspicious deer munching, are getting bushy and full and fat - just how we like them. Summer squash is about a week out - prepare yourself. We're growing all sorts of weird varieties for you this year. Yes, let's consider it a late June miracle... CAULIFLOWER! We could hardly believe it ourselves, but it's true. Cauliflower was the very first thing we planted outside in mid-March, and our eagerness has been rewarded a thousand-fold in the form of little, tender, delicious heads of cauliflower in June. And they said it couldn't be done! If there's one thing to remember about the team over here at DF it's this: we love love LOVE cauliflower. More new pictures, posted here. The first harvest of each crop is always the most delicious, the most beautiful, and the most nourishing, and we're (oh so happily) in the late spring season of many first harvests. The first bok choi is especially crispy, the first flower is especially colorful, the first hakurei is especially creamy. We're honoring each and every first, by admiring and then eating them. The first flower, a cosmo of course. Strawberry flowers, green strawberries growing by the day. The chickens are happy it's spring too, apparently. Chard and kale gets uncovered. Ginger goes in the high tunnel. Garlic forest. We're checking for scapes every day, as they seemingly grow by the hour. After years of complicated choreography involving a rotating cast of multiple refrigerators (some of which dated back to the 1950’s), too many extension cords running heavy on delicate fuses, fans and wet towels trying to preserve moisture and humidity, and a truly scary root cellar, the unspeakable has happened. We built a cooler. We’ve gone to great lengths to keep our veggies fresh and cool - which is a problem that you have never considered until you have a farm, and then becomes the most urgent need you’ve got. We’ve begged and borrowed space to maintain the right temperature for our growing harvests. We’ve woken up hours before a market to find a fridge full of frozen lettuce. We’ve developed completely insane techniques for fitting more crates into a standard size fridge than you would think possible. It’s been a near-constant and near-impossible juggle for years. We may very well be wary of domestic cold storage equipment for the rest of our lives. I may be an architect but my dad is the real building genius. When we asked him to help us build a completely freestanding cooler in a small historic barn, using lightweight and easily movable materials, for significantly less money than a prefabricated walk-in, he didn’t even blink. Instead, he showed up with a trailer full of 2” pink insulating foam – and my family, the best building crew in the universe – in tow. And 24 hours later we had a cooler, mostly consisting of foam and weatherproofing tape, which was brilliantly designed to be maximally efficient and simple to deconstruct and move. It reached precisely 41 degrees ten minutes after we turned it on, and has stayed that way ever since. We have rejoiced. To say my family is awesome is a vast understatement, and we’ve got the perfectly stable cold storage environment nestled in our barn to prove it. And remember the most important rule: you can't let the tape stick to itself or you're screwed. THANK YOU, Guckers. You rock. Hallelujah, it was brilliantly sunny and warm in Edgewood Park for our first market of the season. It felt like spring has finally settled in, as of this morning, right on cue! We'll be selling seedlings and wild ramps through May, and spring greens are coming - we'll have more every week as the weather keeps warming up. Click on through to the ramp entry in the veggie database for a few of our favorite ramp recipes. Garlic, confidently busting out of the leaf mulch that kept it protected all winter. Turns out flower seedlings come in all sorts of unexpected shapes and sizes. The snow finally melted last week, and the woods around the farm were swamp for as far as the eye could see. Luckily we're blessed with fields that drain - when we started prepping rows in the upper field we turned over soil that wasn't too wet, or too cold. 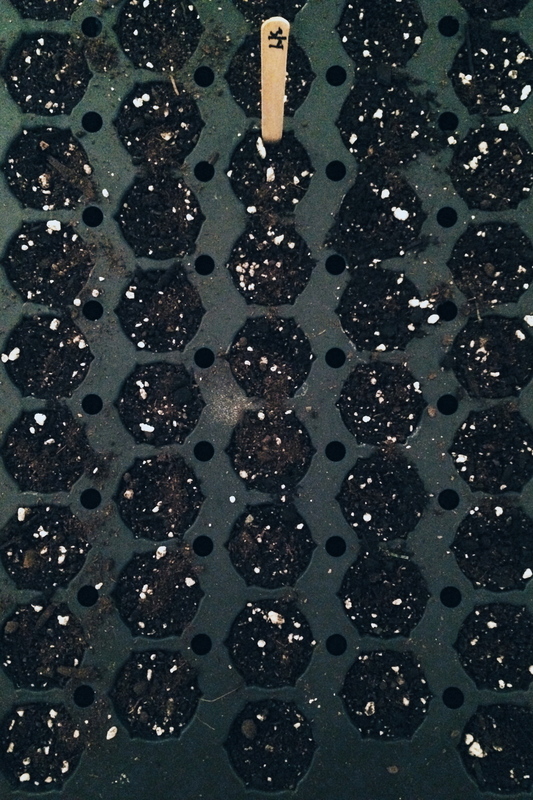 The first round of brave seedlings, scallions and cauliflower, headed out into the field to be planted this week. It's supposed to be 65 degrees this weekend, and with plants in the ground it feels safe to finally say: it's spring. And we couldn't be happier. I'm positively in love with this baby red russian kale. We found it underneath two layers of remay in our recently rebuilt greenhouse, growing contentedly in a corner long after we assumed everything was dead dead dead. It's very, very small, but somehow that makes it seem even more lovable. We've been picking and eating single leaves, in devoted appreciation. The end of March is feeling bleak and colorless on the farm. Though there have been a handful of days warm enough to smell a hint of mud and trees, the ground is still frozen solid. Many building projects and field preparation tasks around the farm are being put off another week or two until it warms up just another few degrees. When we go outside to wander around the fields and listen to the wind, though, we can feel an energy in the soil and in the trees - everything is poised and ready. Our seedlings are growing diligently in the greenhouse, blissfully unaware of the snowy wet forecast this week and the frigid wind rattling the windows. We understand each little baby plant to be a promise – a promise that it won’t be long before the whole landscape explodes in color. A promise of permanently dirty hands and feet, of slow moving thunderstorms, and of mountains of spicy salad greens on our plates. If winter should say, ‘spring is in my heart,’ who would believe winter? The ghost of last year's kale, haunting our upper field. The skeleton of our soon to be resurrected high tunnel - lost late last year in a brutal wind storm. There are some fun projects keeping us busy in these last few brown weeks of March, and small signs of life appearing around the farm. Though we immediately recovered them to protect against impending snowfall, we may have spotted a few garlic sprouts in the leaf mulch, and Aaron has been busy with sap collection and boiling. The wide variety of color and consistency we're getting in our syrup is as mysterious as it is delightful; I really don't think I've ever tasted anything as complex and delicious as our fresh syrup, just a few hours out of the tree and still warm from the boiling. Plus, our house smells so cozy, humid and warm with sap. Sap, straight out of the tree. This maple syrup, only a few hours old and still warm, steaming up our kitchen. Last year's hops, grown right here on the farm, becoming this year's maple beer. In the dark and frigid days of this cold early March, we've started our first few trays of seedlings - mostly onions and flowers. We'll spend the next few weeks keeping them warm, while mother nature makes up her mind and spring, hopefully, arrives. The first tray of flowers. The seedlings take over our study until they're big enough to go outside to the greenhouse. I don't know who let us loose with the seed catalogs, but at last count we had 14 varieties of tomatoes, 15 varieties of hot pepper, and 10 different types of eggplants. Welcome, 2014. Welcome, dark and snowy winter days. It’s hard to believe how long it’s been since we’ve updated the website, and for that we beg forgiveness – late summer was a whirlwind season of blistering hot days, an epic tomato hornworm battle, harvest after harvest after harvest of fresh food, busy markets, new jobs, and little sleep. Not an excuse though; in 2014 we vow to update the website frequently and enthusiastically. After a challenging and a rewarding summer that saw our expansion into a second field and our attendance at City Seed’s Edgewood Market, the season’s end snuck up on us. Before we knew it we were covering the arugula, planting the winter greens, pulling up the dead tomatoes, and watching the fall storms roll in. Then, seemingly all of a sudden, we were mulching the garlic and drying peppers in anticipation of the imminent first frost. Caitlin, for her part, spent the entire fall season feverishly canning and freezing veggies, with a disproportionate preference for hot sauces and relishes. Aaron didn’t stop moving even once until November, when he finally finished his superhuman feat of working both at Darling and at Massaro, which he’s been doing for two whole seasons now. The cold nights then fell, and we built a fire, put on slippers, and rested. Which is all to say: we’re happy to report that the 2013 season was a success here at Darling Farm and we’re already looking forward to some major changes for 2014 season, including bringing on a third farmer (our wonderful friend, the impossibly knowledgeable, effective, and gung-ho Rachel Berg), expanding to a few more fields in our neighborhood, experimenting with growing flowers, and attending a second market. Aaron has been tirelessly analyzing last year’s numbers, and crop planning has begun for next season. Check back in March for our spring schedule, but in the meantime enjoy the restful winter season. Summer will be here before we know it.